For use with Rear Sections 11889 and 11890 to connect to Resonator 60560. By using 11889, S-Type Rear Section with these pipes and muffler 60560 you will lower the sound level to "Touring". 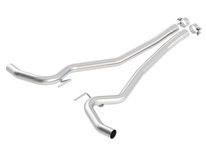 By using these pipes with 11890 Rear Section and muffler 60560 you will lower the sound level. 2015-2016 Mustang 2.3L EcoBoost/ 3.7L V6 Automatic/Manual Trans Rear Wheel Drive 2 Door WITH BORLA REAR SECTIONS AND FRONT RESONATOR ONLY.